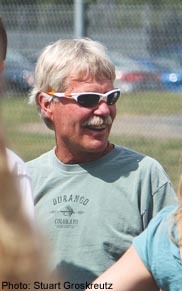 Scott Christensen’s teams have been ranked in the national top 10 eight times. He won the 1997 High School National Championship and his squads have captured multiple Minnesota State Championships. Four Stillwater alumni have broken 4:00 in the mile since leaving the program. Scott has coached 13 Minnesota State Championship-winning teams and 27 individual Minnesota State Champions. He was the USTFCCCA Endurance Specialist School junior team leader for the World Cross Country Team in 2003 and the senior team leader in 2008. Scott is a 14-year USATF Level II endurance lead instructor.